spider-boy has no other items for sale. Stellar-Fire (1993) 001 for the SEGA CD Complete W/ Case-Disc-Manual! ☆ AH-3 Thunderstrike (Sega CD) CIB Complete N Case Box -Works Great- FREE SHIPP! Supermaribros. 16 bit SEGA MD Game Card For Sega Mega Drive For Genesis HOT ! 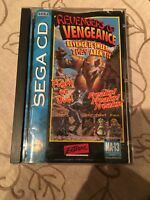 Brutal: Paws of Fury for Sega CD (Disc Only) Fast Shipping! On a clear night with a full moon, you and your sister have found a glowing butterfly. In cautious rememberance of a warning from your grandmother, you remind your sister that to look at a glowing butterfly for too long will result in turning into a butterfly yourself. She doesn't seem to care, though, as the butterfly takes off with her in pursuit. Headed toward an evil elm tree your grandmother also warned you about, you gasp in fear. As you follow her, you see that she has tailed the butterfly into a mansion you swear was not there before. In Mansion of Hidden Souls, it's up to you to enter this mansion and find your sister. The task proves to be much more difficult than it may seem, however, as you encounter more glowing butterflies, each of which can speak. Some may be friendly -- but some are not. The first-person view of the game takes you from room to room, gathering items and clues as you progress. Items include keys, diaries (used to save your progress), and a clock showing how much time you have until your sister is never to be seen again. Only you can save her from the Mansion of Hidden Souls. Mansion of hidden souls is a game that I enjoyed on the Sega CD. It has a compelling story. The game play see you taking the role of Johnathan in the first person perspective. As Johnathan you must save your sister from turning into a butterfly and remaining trapped in the mansion for eternity. One The controls are cool and the puzzles are satisfying to solve. the puzzles do get cryptic towards the end of the game and I wish there was a better ending. Overall I enjoyed this game! Great game for it's era!! Buy mistake I had bought the Sega Saturn Hidden Souls game first. I enjoyed it very much but was ten told it was the sequel the the Sega cd version. So naturally I had to buy the cd version as well. I will admit the resolution wasn't as good as the Saturn but, the game play was fantastic. I highly recommend anyone that likes a good mystery type point and click game, to buy it right away. For a retro game it won't break the bank either. Enjoy! "Mansion of Hidden Souls" is one of those games I waited years to play, then when I finally got a copy I was extremely let down. The graphics are blocky and unrefined and the music seems to play out of sync with the game's action. It's one of those point-and-click affairs that has you clicking on doors and items and making choices via text interface. When you do make a choice you can't really tell what you just accomplished because the responding video is so grainy and choppy you're not sure what just happened. This game suffers the fault that many Sega CD games have in that it was a good idea that unfortunately didn't make the transition through the limitations of the technology of the time. However if you do enjoy this style of game-play I recommend "Dracula : The Resurrection" for the Playstation. This is one game that stuck in my memory from long ago. It was the first game I had played where I could walk around in a mansion and solve puzzles. I like it so well that I dont notice any problems with it at all. For its time it was as good as a game could get. The voices used really set the mood and it is a little spooky at times. Some puzzles can be a challenge and You will find some surprises. I love the music used at the opening of the game. I like this one better than the saturn version. I wish Sega would make a new one for a modern game system or for pc.